What I’m about to say may seem obvious, but please bear with me. LOOKING TO INCREASE THE PERFORMANCE OF YOUR SALES TEAM? 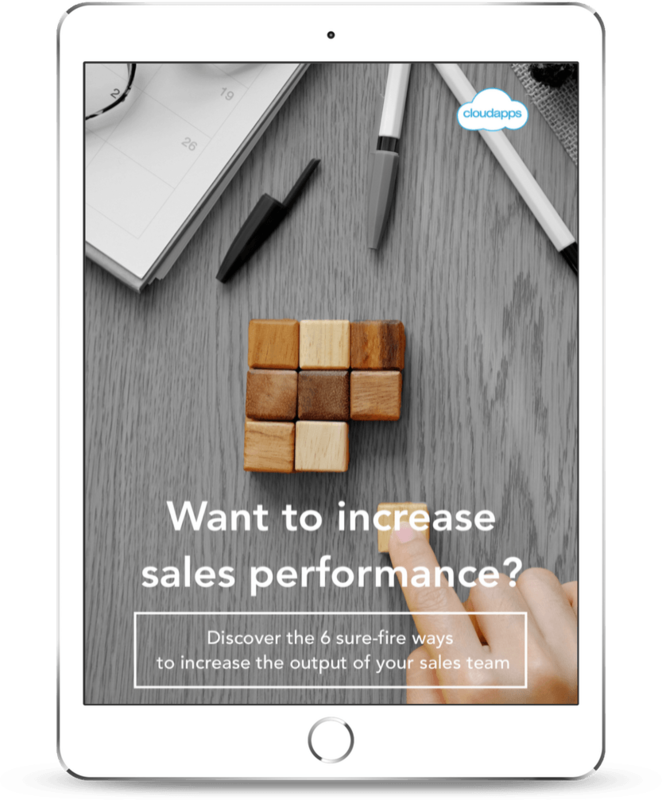 Download your free guide and start supercharging your sales performance! You may have had the privilege to have been around when your current CRM system was selected (and if you weren’t, I’m sure you have heard the war stories). Expectations were flying high, as you saw simpler times ahead. A time where your reps would finally have a tool to help them sell, learn and share more. Forecasting would be clearer, business decisions easier to make and the data accumulated within the realms of your CRM system would set you miles ahead of your competitors. Fast-forward to the present day and the reality is perhaps a little different. Your reps and the CRM system you selected for them have developed a strange love-hate relationship. In as much that CRM loves your reps but your reps hate your CRM. Far from seeing it as a sales productivity tool created to propel their own success, they see it as a management tool, only there to catch them out. This unrequited love has left your poor CRM system in ruins. Unvisited, its data has become out-dated. Knowledge and innovative new techniques are not being shared amongst your team members. CFOs have nowhere to turn when they’re trying to predict the next quarter. Have we reached the time to press ‘eject’ and leave this sinking ship heading to the bottom of the ocean? Or maybe, we should stop blaming our CRM system for something that’s not really its fault. And if we’re going to point fingers, let’s aim them directly at our users and the people leading them. It’s their behaviours and bad habits that are ruining our chances of building a solid and profitable CRM knowledge base. The main users of CRM are salespeople. And salespeople are renowned social beasts who thrive on competition. They would much rather spend that extra hour making 10 more calls than filling out reports. This, albeit laudable, is a double-edged sword. Yes, we want our sales guys to be self-starters that relentlessly chase up our leads but we also need them to be strong pillars to our teams. Lone wolves hungry for their next commission cheque will not reinforce your business. Sure, they may boost your revenue in the short-term but the knowledge they possess on your prospects and deals will go with them if they decide to leave the business. Lagging Sales KPIs are the indicators that tell us what has happened, the final output of our efforts (e.g. £100K deal closed) these are easy to measure but very difficult to impact. On the other hand, Leading KPIs track the steps necessary to reach our final output (e.g. 50 calls a day, 4 face-to-face customer meetings a week etc.) and so, have the biggest impact on our end results. The fastest way to increase sales motivation is by working out exactly what Leading KPIs make your Lagging KPIs happen and driving faster achievement of them. Use these to coach your team. So, rather than telling a sales guy to ‘sell more’, encourage them to ‘make more calls during the golden calling hour(s)’. Typically, reps are measured on their end results; like how many deals they closed this month. But, if what you really want is to increase sales motivation, start rewarding them every time they use the system to update their meeting notes, set closing dates or add new contact details. SuMo Motivate will help you to track and monitor these positive behaviours, offering coaching prompts at the time of action and rewarding users with points and badges every time they use the system correctly. SuMo rewards them every time they take the small steps that make up the journey to success. Start small and only increase the complexity of what you’re asking your reps to do when the new behaviours become habitual. You are already sitting on the only resources you need to increase sales motivation & bust your quarter – your team and your CRM tool. All you need to do is supercharge the relationship between these two great assets. Better user adoption will lead to insightful data, a stronger, more knowledgeable team, clearer forecasts and a happier CFO. For more information on deploying behavioural motivation to increase sales motivation, feel free to get in touch with our expert team. They can help you rapidly scale your sales effort.